This is quite possibly my favorite opening sentence from a novel, and it sets the tone for the drug-addled adventure that is Fear and Loathing In Las Vegas. The story is an exaggerated account of Hunter S. Thompson’s pursuit of the American Dream in Las Vegas. Accompanied by “Dr. Gonzo,” his faithful attorney, Thompson (as Raoul Duke) is initially sent out to Vegas to report on the off road race known as the Mint 400. However, this work is quickly scrapped in favor of just getting blitzed and then becoming involved in random bizarre adventures. Fear and Loathing is absolutely hilarious, and is certainly one of the funniest books I have ever read. Duke and his attorney find themselves in some very precarious situations. On their ride into Vegas in the “Great Red Shark” (their rented red Chevy convertible), they pick up a hitchhiker who quickly becomes scared shitless by their drug-induced craze. In Vegas, Dr. Gonzo brings a Jesus and Barbara Streisand loving innocent young girl back to their hotel room, where he proceeds to give her acid (when she had never even gotten high before). There is also an extremely amusing encounter with a hotel maid who stumbles into their room when both Duke and his attorney are stark naked. The dialogue is just incredible here, and Thompson’s unique way of writing makes everything even more entertaining. If you think that sounds insane, well, you are absolutely right! Some people are turned off from this book because of the drug binges, but if you do so you are missing out on a wildly entertaining and witty novel that also indulges in biting satire. I have lent my copy of this book out to many friends and family members, all of whom have also loved this. 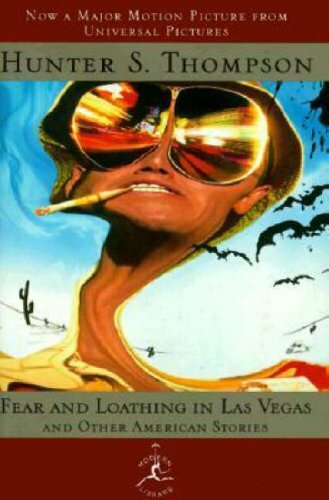 Fear and Loathing In Las Vegas is one of my favorite books of all time, a rare novel that I can read over and over again without losing interest. If you are able, pick up the Modern Library version of the book, which also comes with two of Thompson’s short stories. I cannot recommend this book enough! It bothers me to think that people would miss out on this book because their are mentions, use and discussions of drugs in it. It’s such a witty, hilarious and well-done book that ignoring it for such a reason is silly. Great review! Absolutely! This is still one of my all-time favorite novels. Love the film, too! I saw the Depp movie a long time ago, when I was probably too young to appreciate/understand it… I just remember it being very… trippy.. I now kinda regret watching it before tackling the book, although, I think I have forgotten it enough that it may not taint my enjoyment of the novel. This book was purchased on my most recent “binge buying” spree I do sometimes when I see how many ‘classic’ books i can find for a penny on Amazon. Definitely looking forward to giving this a shot. Oh yeah, the book is fantastic, one of my all-time favorites. It made me appreciate the film even more, too. It’s actually a pretty faithful adaptation of the book, and I think that throws off a lot of people who go into it not knowing what to expect.